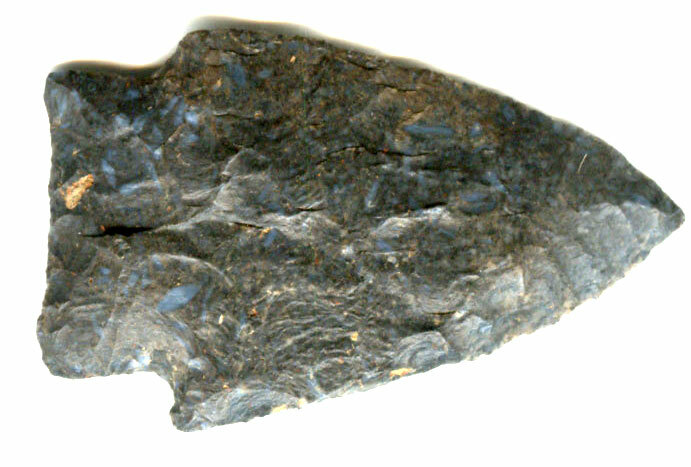 A Normal Size, Colorful, Visibly Aged And Anciently Use Sharpened, Vosburg Point That Exhibits Surface Sheen And Stone Coloration Aging Patination, Aging In The Corner Notches, Aged Surface Deposits, Correct Aged Bevel Blade Sharpening Use Reduction, Aged Surface Deposits, Correct Archaic Style Flaking, Correct Material And Manufacture For The Area Found. Repeated Ancient Sharpening Has Reduced The Blade Length And Width Somewhat On This Nice, Typical Example! Includes Central Kentucky Relics ( Jason Broughton ) And Ken Partain Certificates Of Authenticity!